1) Residential: 0.35% of assessed value. This rate applies to any property where an owner successfully claims the home exemption (click here for the home exemption form), irrespective of the assessed value. An owner can only claim the home exemption if it is the owner’s primary residence. Proof of primary residence may be satisfied by showing evidence you are registered to vote in Honolulu, file income tax return as a resident of the State of Hawaii or occupy the home 270 days or more per calendar year. Owners who successfully claim the home exemption, benefit from an $80,000 exemption, which means $80,000 is deducted from the assessed value and the homeowner pays property taxes based on the balance. For homeowners 65 years or older, this exemption increases to $120,000. Example: Owner’s age: 45, Owner’s Primary Residence, Property Assessed Value: $1,600,000, Exemption: $80,000. Taxable Amount: $1,520,000 ($1,600,000 – $80,000). Estimated Annual Taxes = $5,320 ($1,520,000 x 0.0035). 2) Residential A: Two tiered tax rate (0.45% of assessed value up to $1,000,000 and 0.9% of the assessed value above $1,000,000). Residential A applies to properties where an owner does not claim the home exemption and the total assess value is $1,000,000 or greater. Example: Owner’s age: 45, Owner’s Second Home, Property Assessed Value: $1,600,000. Estimated Annual Taxes on Assessed Value up to $1,000,000 = $4,500 ($1,000,000 x 0.0045). Estimated Annual Taxes on Assessed Value Above $1,000,000 = $5,400 ($600,000 x 0.009). Estimated Annual Taxes = $9,900 ($4,500 + $5,400). 3) Hotel & Resort: 1.29% of assessed value. Example: Property Assessed Value = $1,600,000. Estimated Annual Taxes = $20,640 ($1,600,000 x 0.0129). An owner of a condo classified as Hotel & Resort who does not run short-term vacation rentals, may apply for a dedication to Residential, which, if granted, would lower the owner’s tax rate. Learn more about the dedication right here. 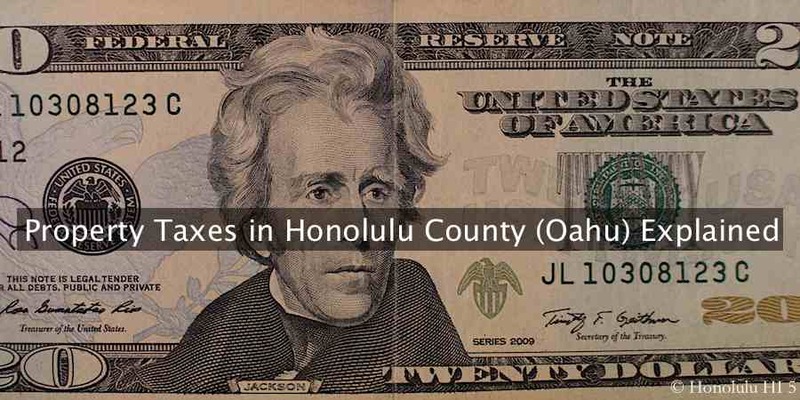 When Are Property Taxes Due in Honolulu? 2nd Installment: Due February 20 (covers January 1 – June 30 taxes). The bill will be mailed to owners in January. Note 1: If Aug 20 or Feb 20 falls on a holiday, Saturday or Sunday, then payment deadline is extended to the next business day. Note 2: An owner may pay the entire 1 year property tax bill, as part of the 1st installment – no need to wait until the 2nd installment deadline in February. How Can I Pay My Honolulu Property Taxes? 1) Online: www.hnlpay.com. There is a 2.35% fee for Discover, Visa or MasterCard credit cards and a 1% fee for Debit cards. 2) Phone: Call 1 (877) 309-9117. 3) Check: Issue a check to “City & County of Honolulu” and mail it to City & County of Honolulu, Real Property Tax Collection, Division of Treasury, PO Box 4200, Honolulu, HI 96812 (verify before mailing). 4) In Person: Pay in cash or with a check by visiting City Hall, Division of Treasury, 530 South King St #115, Honolulu, HI 96813. Hours: Monday – Friday (except holidays) 7.50am – 4.15pm. What is Assessed Value & How is it Determined? Property taxes are based on assessed value, which is a value the tax office’s appraisal team determines a property is worth, which is different from the actual market value – the price a Buyer actually pays for a property. An appraiser from the tax office will typically review and analyze 5 comparable properties that have sold prior to July 1 of a given year (without actually visiting the properties) to determine the assessed value of a given property for October 1. Since the appraiser only analyzes comparable properties sold prior to July 1, the appraiser will also evaluate how much the market may have moved up or down in the 3 month period from July 1 to October 1 and also consider such market move in determining the property’s value on October 1. The assessed value on October 1 is used to calculate property taxes due the following fiscal year. Example: The assessed value on October 1, 2017 is used to determine property taxes for fiscal year 2018, which runs July 1, 2018 – June 30, 2019. See our post How is Assessed Value Determined for New Construction. How Do I Contest an Assessed Value? An owner can contest and appeal the assessed value if an owner believes the assessed value is too high. However, make sure to have actual recent sold data to back your claim. Feelings about market directions and properties listed for sale (not sold) is irrelevant. Appeals can be filed online From Dec 15 of a given year through Jan 15th of the following year from this site (click on “File an Appeal”). What Is The Penalty for Late Payment of Property Taxes in Honolulu? Interest at the rate of 1% for each month will be applied to all delinquent taxes and penalties. If you are a new property owner, requesting the tax office to send your tax bill to a different address than the previous owner, it may take about 4 months before the City & County of Honolulu updates their records with your address and a property tax bill may mistakenly be mailed to the previous owner’s address. You can, upon taking ownership, call the Honolulu Property Tax Department (808) 768-3980 and ask them to mail the next tax bill to your address. 3) Enter the Street Number, Street Name and Unit Information. However, for “Street Name” do not include street suffix such as “Boulvard”, “Street”, “Avenue” etc. Example: If you want to search for “1118 Ala Moana Boulevard” enter “1118” under “Street Number” and under “Street Name” you enter “Ala Moana” without “Boulevard”. Disclaimer: This information is for general information purposes only and should not be relied upon for any legal, business, economic or tax decisions. We are a real estate agency, not tax or legal advisers, and we do not provide any form of legal or tax advice and before making any decisions you should consult with a qualified adviser.